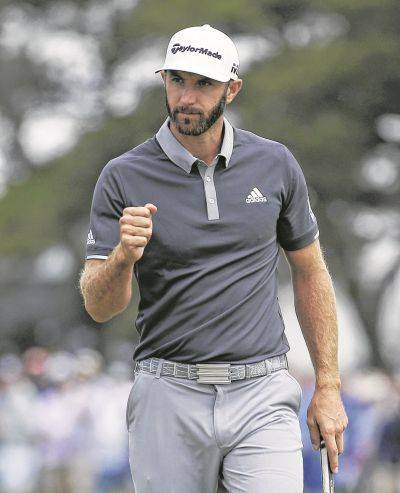 Dustin Johnson hits out of the rough on the 15th hole during Saturday’s third round of the U.S. Open in Southampton, N.Y.
SOUTHAMPTON, N.Y. — Dustin Johnson at least gets one more round to try to redeem himself in the U.S. Open. The best players in the world were no match for a Shinnecock Hills course that even the USGA conceded got out of hand Saturday. Putts were rolling some 50 feet by the hole and over the green. No one from the final 22 groups could match par. Johnson didn’t have anything like the 82 he had at Pebble Beach when he entered the final round with a three-shot lead in the 2010 U.S. Open. This was more of a slow bleed that began with a shot off a sandy path and three putts on the par-3 second hole for his first double bogey of the championship. His lead was gone with a three-putt bogey on the par-3 seventh. He was back in the lead when everyone around him couldn’t hang on.